Shake without ice, then shake longer with ice. Strain into a chilled cocktail glass and garnish with a barspoon of Angostura bitters, swirled into a pattern using a toothpick. 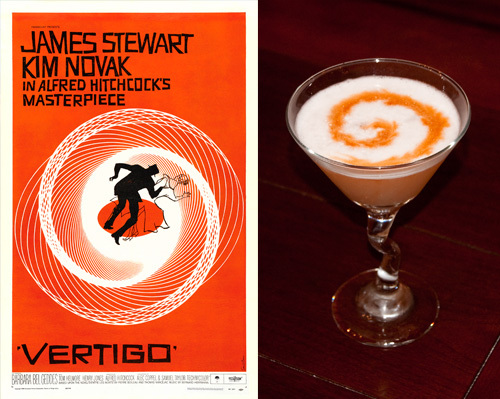 The first thing I thought of when considering a drink for Vertigo was the famous Saul Bass poster with the spirals and I knew I wanted to create a drink that would allow me to do that. An egg white would help with that, and considering that many friends have appeared queasy and afraid when I mentioned an egg white drink, I thought it would be doubly appropriate. Beyond that, I went with tequila for Carlotta Valdez in the movie (who was probably Spanish, not Mexican — I couldn’t remember, but ah well) and lots of floral flavors for the flowers that played a prominent role in the film. Oh, that’s really impressive. Well done.